With increased globalization, it is critical for today's managers and future business leaders to increase their understanding and comfort level with customers, associates, and partners' abroad. In response to the ever-growing need for business and cultural information, Sherisen International Inc. offers practical, informative materials, which are used in our cross-cultural business training workshops. 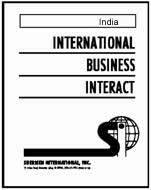 Available for 50 countries, the International Business Interacts will assist today's global managers and MBS students to become more effective in communicating across borders and building critical global relationships. Each Interact is 16-18 pages in length. Revisions are on-going. Under a special licensing arrangement with Sherisen International, the complete set of Interacts is available in U.S. and Global versions, in Microsoft word, pdf, or in HTML format for a business or university intranet. Licensing fees available upon request. "The International Business Interact series has been an invaluable tool for the students who take our international project courses each year. The information was an important 'must have' in their MBA tool kit before and during their international assignments. I would strongly recommend that a school or business organization who has international travelers, projects, business locations, and/or aspirations within the global business community, offer the entire set in both printed and on-line versions for real-time use. The value received will greatly exceed the price."